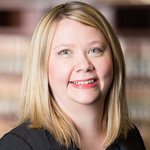 Jennifer Prilliman is the Law Library Professor and Interim Director, Chickasaw Nation Law Library at the Oklahoma City University School of Law Library. She teaches Advanced Legal Research, Oklahoma Legal Research for Practice, and is an instructor for the Ron Norick Municipal Law Clinic. Her research interests include legal information literacy and instruction, copyright law, open access, and ethics.